Our intrepid literary adventurer Tuesday McGillycuddy returns in the sequel to the wonderful Finding Serendipity. After her adventures following her mother, author Serendipity Jones, into the magical land of story, Tuesday is now working on her own manuscript. Everything seems to be back to normal until strange things start happening to authors all over the world. They are disappearing and then returning in unexpected places, injured and disoriented. Tuesday’s parents ban her from writing to protect her, but Vivienne Small, the heroine of the books written by Serendipity, sends out a call for help and Tuesday and her dog Baxterr have to respond. Can Tuesday, Vivienne and Baxterr discover what is going wrong and fix the problem before the magical world, and all the stories it contains, is destroyed? 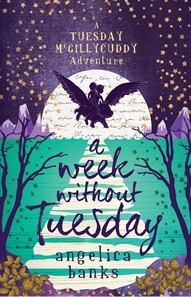 Filled with daring, adventure, magic, humour, mystery and just enough danger to keep the pages turning, A Week Without Tuesday is a wonderful junior/middle fiction adventure series with the story focused on two bold, courageous female characters, the real world Tuesday and fictional Vivienne. The appeal of the stories is likely to extend beyond young boys and girls to anyone with a love of books and storytelling. Anyone who has ever been caught up in a book, transported to a fictional world as they read, will appreciate the land of story and the way it explains how stories are created and the powerful impact fictional characters and places can have on readers and writers. I love these clever books, written by two Tasmanian authors under the joint pen name of Angelica Banks. I love Tuesday’s passion and loyalty, Vivienne’s bravery and sense of adventure, the amazing library in the land of story with its dedicated Librarian, and the mystery at the heart of this second Tuesday McGillycuddy adventure. I love that these adventures celebrate the power of story and the way stories can connect people and encourage them to be braver, stronger and more resourceful. Finding Serendipity and A Week Without Tuesday are highly recommended for readers who enjoy clever, quirky stories filled with adventure and wonderful characters.